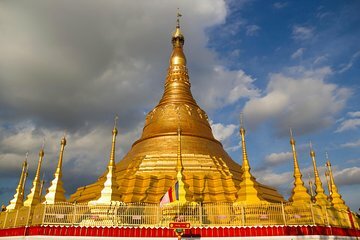 This private excursion to the Golden Triangle lets you cross the Thai border into Myanmar for a glimpse of local Burmese culture in the town of Tachileik, where you’ll see a replica of Yangon’s Shwedagon Pagoda. Enjoy a 'tuk tuk' ride, eat a local lunch, and visit a hill tribe village and bustling market before returning to northern Thailand to view the Hall of Opium. Round-trip hotel transport by private vehicle is included on this full-day tour from Chiang Rai. Cuando su automóvil privado lo recoge en su hotel de Chiang Rai, lo llevan a la frontera norte de Tailandia, donde lo acompañará su guía a Myanmar (anteriormente Birmania). Una vez que cruzas a Tachileik, un tuk tuk de tres ruedas te lleva a dar una vuelta por varios templos. Deténgase en el Templo del Elefante Enrobado con adornos dorados y conozca el intrincado diseño arquitectónico. Admire la arquitectura típica de los templos birmanos en la pagoda Maha Muni antes de continuar con una réplica de estupa dorada de la pagoda Shwedagon que muestra a un gran Buda dorado flanqueado por discípulos de estatuas. Otro punto culminante de la cultura es la visita a un pueblo de la tribu Karen Hill de cuello largo, donde puedes comprar artesanías hechas por artesanos locales; Cada venta proporciona ingresos para la comunidad. Mientras explora con su guía, limite las fotos de mujeres locales, cuyos cuellos alargados, tradicionalmente adornados con pesados rollos de bronce, representan la belleza y la identidad tribal. Deténgase para almorzar en un restaurante de platos birmanos, luego explore los productos en un mercado antes de volver a cruzar la frontera hacia el Triángulo Dorado. 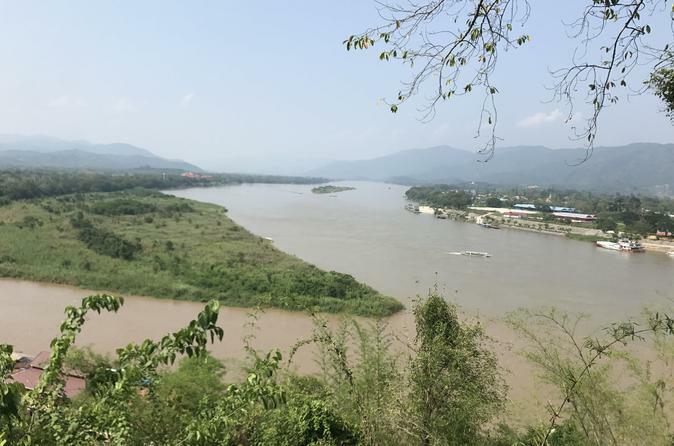 Vea dónde se encuentran Tailandia, Myanmar y Laos en la confluencia de los ríos Mekong y Ruak. En una visita al Hall of Opium, aprenda sobre el comercio de opio en la región, ahora suplantado por la producción de té, con un viaje alternativo en barco por el río cuando el museo está cerrado los lunes. Después de su tour privado de un día, regresará a su hotel de Chiang Rai. A great tour which can experience three country (Thailand, Myanmar and Laos) in one day and not in a hurry. No visa is required to go to Myanmar but you need to make sure that your passport can re-entry Thailand. This is a fantastic tour! Our guide Tony was amazing - really fun, knowledgable and very professional. Agree with all the other reviews - interesting itinerary, well paced, great sights and food. Couldn't have asked for more, thank you so much! An absolutely fantastic one day visit into Myanmar. The excellent and friendly guide arrived to pick us up promptly at 08:30 and we set off on an action packed 10 hour excursion. The guide was well informed, spoke very good English and took time to introduce this new country to us as first time visitors. Thank you Green Trails Thailand. Excellent trip with good itinerary. Tour guide and driver were extremely helpful and accommodating of my 85 year old grandmother! This tour was fantastic. Tony our guide was extremely knowledgable, spoke very clear English and was really enthusiastic about making sure we saw as much as possible. I was slightly nervous about the tour because I could only find it on Viator and there were only 14ish reviews, but all were good. I am glad I took the leap and booked anyway. Since we went on a Monday, the opium museum that is normally a part of the tour was closed this is stated in the description, so we went to a smaller museum and then Tony took us in a boat to a market in Laos. The market in Laos is very touristy and does not really give a good example of Laos culture, but it was fun to be in 3 countries on one day, nonetheless. I highly recommend this tour. Exactly as described in the web, 2nd time using viator services, very pleased. This package is well recommended for those who wants to do 1 day trip, money worth while for private tour. Tour Guide Tony green trails very well informed, engaging and he didnt rush us. Das ist eine ganz coole Tour. Jederzeit zu empfehlen. Guide war super und wusste sehr viel zu erzählen. Danke. My friends and I had a wonderful time on our day trip to Myanmar and the Golden Triangle! We LOVED stopped at the tea plantation in Chiang Rai-- wow! It was beautiful and the tea and snack that we had were delicious. Our guide, I'm not sure how to spell his name but we pronounced it like Chucky he spoke great English and he was very knowledgeable about everything we did on our tour. Tip: Don't forget your immigration card when you bring your passport to cross the border into Myanmar- you will need that. We loved the food, the temples in Myanmar, the shopping, and the views were beautiful in the Golden Triangle. Our guide was great with photos and everything. Opium museum wasn't my favorite--- but I'm not really big into museums. I would highly recommend this private tour! !